What is the common usage? What type of Wall pads are available in the market? What is the difference among all the wall pads? Wall pad is the special creation, is made with the sponge, and other material just like the safety pads. It is needed everywhere in a gym or other recreation area. I am damn sure that at this point, you are thinking that it is not as much as beneficial but after reading the article you may find that my answers are right. 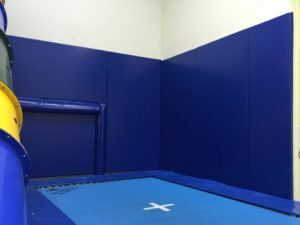 Whether you have a gym or commercial training room or a domestic dojo, you will not want to a repair or replace every wall on a regular basis, because of the safety of your students while training sessions. You may want to consider these tips and tricks of an expert to measure and install. But the installation of the interior wall is not easy every time. Mostly it is used in sports. As you know that safety is an obvious priority. Injuries can occur at any time, from competition to practice at home. So, as parents, coaches, teachers and sports organizers, it is extremely important to prepare athletes for safety in every way possible. So mostly in the sports organisation, Gyms, Sports schools, national level sport and many other palaces the Wall pad are usually used. To prevent the reduction of risk, use this and ultimately prevents serious injuries in all areas. The wall pads can be installed indoors, around sports courts, indoor courts or any type of exercise room for the home. In addition to protecting the athletes, wall padding can also protect your walls. In the sport and home, the temporary or removable configuration is used, but in the Gym, the permanent one is used. The Light Weight padding provides continuous protection on the walls of fitness areas, wrestling rooms, home gyms and exercise rooms, training rooms, preschools, day care centres and early childhood centres. It is very easy to install and can be combined with the different colour of any classic wall pad. This is perfect padding for gyms, basketball courts and interior walls. This wall pad offers multiple protection and available in different size, styles and maximum versatility. It has reinforced laminated vinyl, so it provides superior puncture, tear and fire resistance. This Padding offers continuous protection from medium to heavy duty for wrestling rooms, gyms, basketball courts and defensive training rooms. It is Easy to clean, available in the different colour of vinyl paint. It can be customized with its illustrations and graphics and can be combined with the different. You already read this article and get the information about the wall pads, just want to say that the ultimate goal of the Wall pad is to protect any person against serious injury. if you are an athlete you can feel the impact of the Wall Padding.